Trevor Pateman's Philately Blog: Former Soviet Union: Postmaster Provisionals of the 1990s. Former Soviet Union: Postmaster Provisionals of the 1990s. If you [meaning anyone] walked into your local post office to send a letter, would the post office clerk use (or sell you) a stamp of that issue? It does not matter if the idea for the issue had come from a local collector or printer. It does not matter if 50% of the issue had been allocated to that person to sell abroad. It does not matter that money may have changed hands. All that matters is that an ordinary person who wanted to send a letter would be sold the stamps in question at the post office counter. On this test, there are many issues which clearly Pass including ones which look incredibly philatelic like the Fauna issues of Bukovina. Those stamps can be found all over private and commercial mail going abroad. At the same time, a small group of people were busy selling them to dealers and collectors outside Ukraine, an improvised Bukovina philatelic bureau if you like. That's irrelevant. Anyone would be sold these stamps when they went to post a letter. That's all that matters. A genuine post office cancel on a stamp is not a guarantee that the stamp was on sale at the post office. It’s clear that you could walk into a post office with a hundred or a thousand covers franked with your home-made fantasy and pay a clerk to cancel them all. Similarly, it is quite clear that when and where conditions were chaotic, you could put any stamp you liked onto an ordinary letter which went into a mail box and got machine cancelled. You could put on a stamp of Equatorial Guinea if it took your fancy. In most cases, no one was checking the mail and applying Postage Due. That is what "chaotic conditions" means. For this and other reasons, forensic examination of covers can only take us so far. What we really need in every case is an (honest) account by a participant of what happened. I don’t mean one of those official-looking documents which solemnly record Numbers Issued and so on. I mean a collector or a printer or a postmaster simply telling the story: This is what we did. Only in this way are we ever going to make sense of items like the one at the top of this Blog which has a machine cancel of Nizhni-Tagil (out in the Urals) for 29 12 92. I have no doubt the machine cancel is genuine and that it is over the OPLACHENO and the 60, but what is the status of those? Someone has to tell us! (Maybe they have and if you know the story, please tell it here). It’s long enough ago for no one really to mind that it was sometimes all a scam or done in breach of regulations or despite warnings from higher up not to do it. 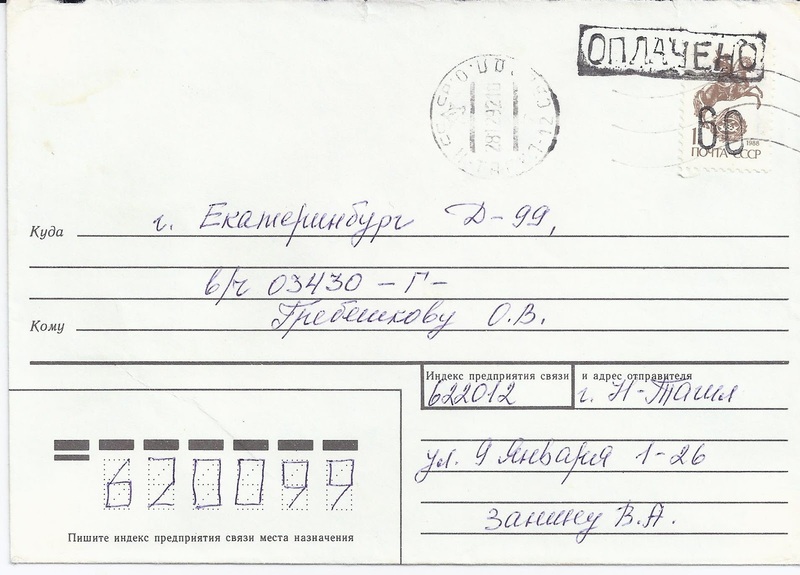 Back in the 1990s, when I got sent all kinds of strange stamps, I would sometimes stick copies on a blank Soviet-era envelope, add my address, send it off to wherever (say, Birobidjan) with a polite note asking the local postmaster to send back the cover. Sometimes it did come back, through the post, but then I realised it still didn't solve my problem. Maybe life was boring in Birobidjan and it just made the day a bit more interesting when you got a letter from England and an envelope inside which was plastered with labels you had never seen before. No harm in being friendly and sending it back as the tovarisch requested. 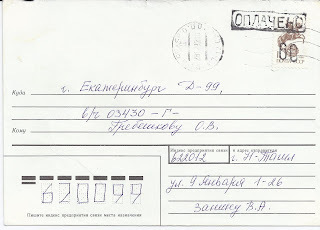 Although the style of writing in much of the (post)-USSR is uniform across the country (just as it is for a certain age-group in the USA), if you have in your collection/accumulation/stock a few covers all in the same hand, with the same sender and addressee, and the same stamps and postmarks, it is likely that they are all fabricated. Even then that doesn't mean they are bogus, just as having a backstamp from one of the other 15 countries doesn't mean that they are genuine, because most of them were in the same boat. A better indication of genuineness seems to be letters sent outside the CIS, and letters within which had machine- cancels as receiving marks. BTW, I still haven't examined ALL the covers that I bought from you oh so long ago! Unfortunately GB stamps and business took time that I wanted to devote to that postal history. Interesting to me insofar as I had much confusion as to what a post office in Russia actually does. It never seemed to me that anyone actually mails letters there. Everyone is on line for government forms, pension accounts, official labels, filing paper work. But buying stamps? Nyet. I couldn't even find a way to mail a postcard. They (postal tellers in Novorossiisk cental post office) simply did not understand what a post card is, and insisted that I buy an envelope with pre-determined postage rate affixed to it. They literally had no postage stamps to sell in the post office, and claimed private persons could not affix stamps by themselves.